No-sting Koogle™ Balls for fearless kids. You control the size, bounce and softness. Inflate to the size you want - 7" to 9". A great "first dodgeball" for younger kids. Spectrum™ Koogle™ balls have a special no-sting surface. Control bounce, size and softness by the inflation level. 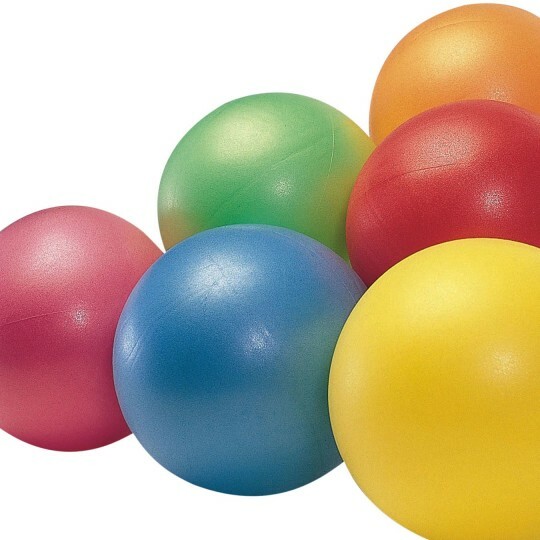 The size of balls will vary from about 7" to 9" in diameter, depending upon how much the user inflates the ball. Set of 6 contains 1 each of 6 different colors: usually red, yellow, blue, green, orange and pink (colors may vary). Our summer camp uses these for all kinds of activities indoor and outdoor. The bounce adjust ability is great and they are super durable. We buy more every year. We use them every day and they hold up great and are easy for small hands to play with. We use this for kids as young as 4 months up to 10 years old. They love them. Easy to catch and for us easy to clean. No 'plugs' for the young ones to pull out and they maintain their colour and shape. Use these daily in our classes for kids 3 and under. They love them!! I bought these for use at our The Little Gym after multiple balls from another company kept getting popped by students who would bite at the opening to get the plug out. I love how these don't have exterior plugs that can be pulled out. I will be ordering these balls from now on and highly recommend them to my colleagues.